La Terrazza condominiums in Jacksonville, Florida. 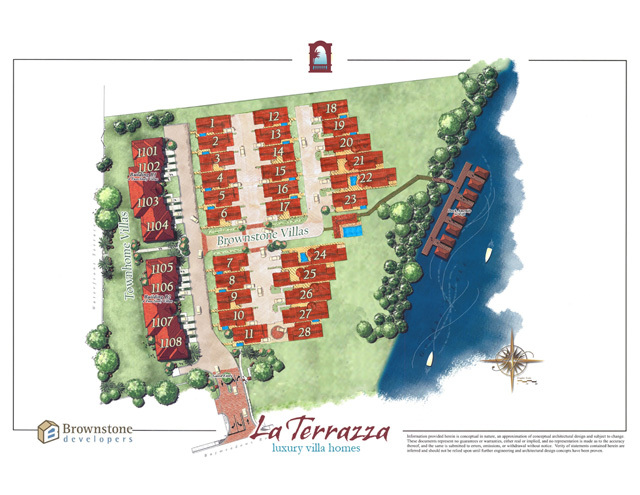 La Terrazza is a new waterfront community featuring 28 luxury single-family semi-custom villa homes and 8 terrace townhomes in a gated residence nestled on Goodby's Creek. Privately secluded behind an elegant gated entry with impressive columns, La Terraza offers covered boat docks with lifts and easy access to the St. Johns River. An amenity center features a spectacular designer pool, clubhouse with kitchen, fitness center, and a creek-side outdoor living area for year-round outdoor enjoyment. Lawn care is maintained through the homeowner's association for a care-free, convenient lifestyle. As an added benefit, homeowners will enjoy membership to historic Epping Forest, Jacksonville's premier riverfront yacht club, offering gourmet dining, a state of the art fitness center, tennis, and fun-filled programs for the whole family. Located on a 5.7-acre site in the Old San Jose and Baymeadows area, La Terrazza is centrally located close to historic San Marco, Baymeadows, Old San Jose, Southside business district, downtown Jacksonville and an abundance of fine and causal dining in the immediate area. See site map. Built with exquisite materials selected from around the world, La Terrazza offers two, three, four and five bedroom villas ranging in size from 1000 square feet to over 3000 square feet. Crafted into the natural landscape to preserve the property's towering oaks and terrace-like creek bank, La Terrazza features courtyards, outdoor fireplaces, loggias, and balconies designed around richly detailed Mediterranean architecture with tile roofs, loggias, gallerias, rotundas, detached garages with sweeping staircases that lead to bonus rooms or guest suites complete with cafe-kitchens, and more. 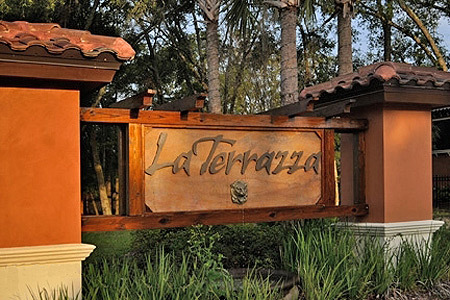 La Terrazza offers variety of floor plans that provide indoor and outdoor settings designed to transition into architecturally rich and stunning spaces for formal events or casual, impromptu gatherings. Spacious outdoor living areas, such as courtyards with optional outdoor fireplaces and plunge pools, summer kitchens, loggias and balconies provide home owners a relaxing, romantic atmosphere for dining al fresco or quiet relaxation with a favorite beverage. Brownstone Developer is a community builder. Please call or email me today for pricing and availability. I will represent you at no charge!